Simple, simple, simple. This Slow Cooker Corned Beef Cabbage takes about 15 minutes active time and then 8-9 hours in the slow cooker. Throw it in before work and come home to a fabulous meal that is moist, delicious and to-die-for. Hi. It’s Lois in the kitchen, talking about Slow Cooker Corned Beef Cabbage Dinner that we had for our St. Patrick’s Day meal. There’s no need to be intimidated by Slow Cooker Corned Beef. Peel the vegetables (or not), sauté the onions and carrots (or not), toss the veggies in the Crockpot and the corned beef brisket on top, cover with water and spices, and cook for 8-9 hours. There’s only one little part of the recipe that needs to be done later—the cabbage. Or it gets too soggy. But it’s easy to solve that problem. Check it out in the recipe. Watch me talk about this recipe on WHSV’s 1 on 1 program with Bob Corso. You’ll need a slow cooker for this recipe. There are lots of different models. I have a simple one that I got years ago and it still works just fine. If you pick up a used one, be sure to check it out to make sure it doesn’t have a short in it. You don’t want to end up like This Is Us. I know you’re gonna wanna eat this. I do. Every kitchen should have the very best tools you can afford. At the least, buy yourself a good set of pans, a slow cooker, an Instant Pot, measuring cups and spoons, and the best set of chef’s knives you can afford. Also be sure to get a full sized food processor and a mini food processor. These tools are essential for any well-equipped kitchen! Knife Set, 15-Piece Kitchen Knife Set with Block, ABS Handle for Chef Knife Set, German Stainless Steel, Emojoy (Red). Buy them on Amazon. 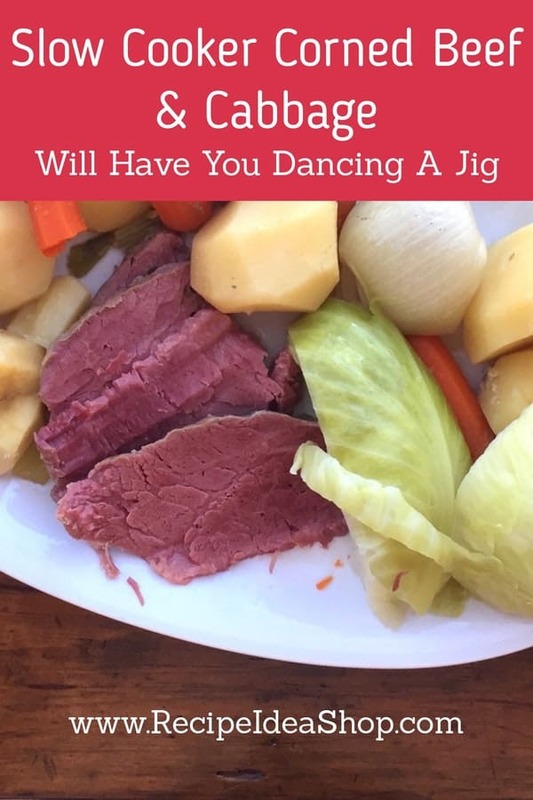 Juicy, easy Slow Cooker Corned Beef and Cabbage. You got this. When the oil is hot, place the corned beef in the skillet and brown it just a bit on both sides to seal in the juices. When browned, set it aside to another plate. Sauté the sliced onions until almost transparent. Transfer the onions to your 6-quart slow cooker, placing them along the bottom in a single layer. Return the skillet to the stovetop and cook the carrots until they start to brown slightly. Dump the carrots into the slow cooker. Add the remaining onion, potatoes and celery, if using, to the slow cooker. Place the corned beef brisket on top of the vegetables. Add the bay leaves, pickling spices and juices to the slow cooker. Add the cabbage to the pot about an hour before you wish to eat (or my preference is to steam it separately for about 20 minutes). Continue cooking on low for about 1 hour. Slow Cooker Corned Beef & Cabbage Nutrition Label. Each serving is 1/6 the veggies (about 2 potatoes, 2 carrots, 3/4 cup cabbage, and 1/4 cup onions) and 1/4 pound corned beef. Slow Cooker Corned Beef & Cabbage Nutrition Label. 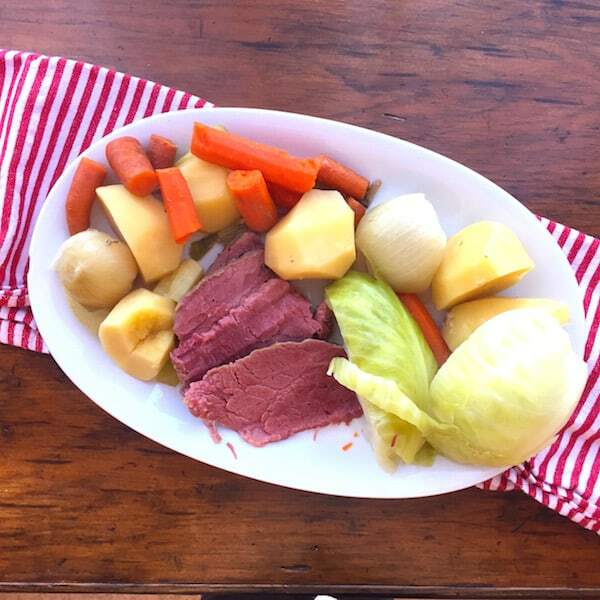 Each serving is 1/6 the veggies (about 2 potatoes, 2 carrots, 3/4 cup cabbage, and 1/4 cup onions) and 1/2 pound corned beef. 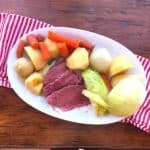 Slow Cooker Corned Beef and Cabbage (NO POTATOES). 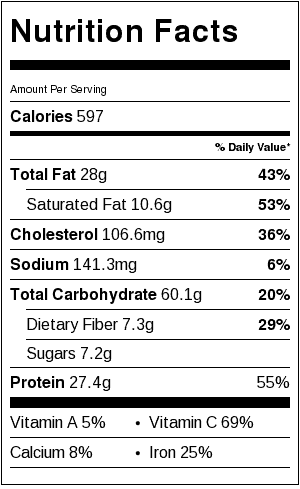 Each serving is 1/4 pound meat and 1/6 the vegetables. Trust me, you’re gonna love this recipe. But don’t stop there…subscribe to our email newsletter and get a free cookbook.